ENG: My loves, I keep getting the question of where I purchase my vintage designer pieces and of course I don’t have THE ONE answer to the question, since there are so many options to get them online and offline. When eBay got in touch with me recently we thought about which topic could be interesting for my readers and I immediately came up with the category ‘luxury vintage’. Did you know that every piece in this category is strictly checked for quality and authenticity, which is then guaranteed, too? 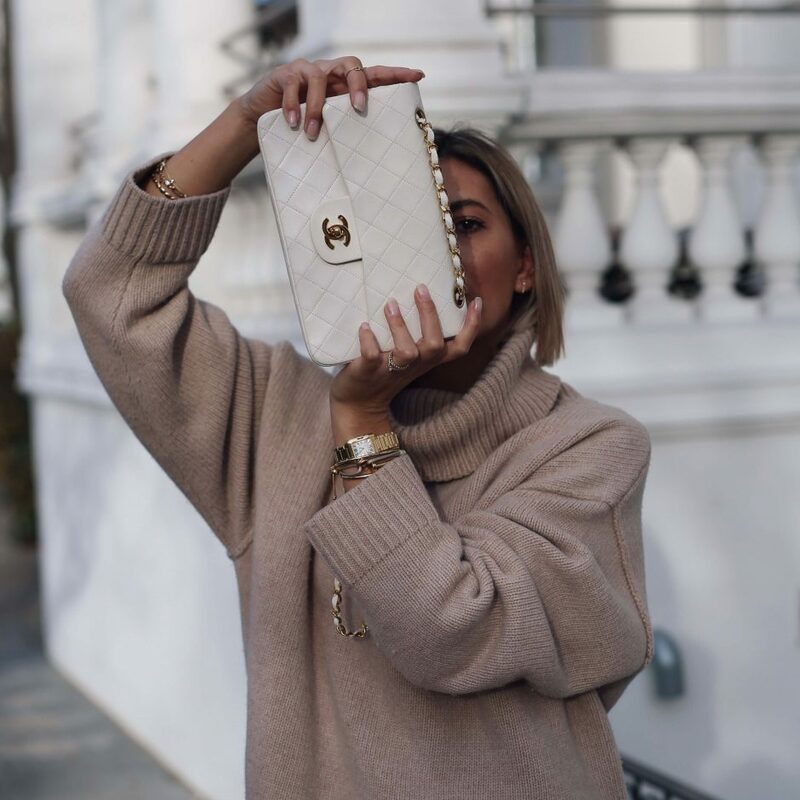 Additionally, you have the option of sending back the pieces you have bought in the luxury vintage category, too, which limits the risk of a wrong purchase to an absolute minimum. Especially in the higher priced vintage segment these aspects are really important to me, so that you can maintain the good and especially the safe feeling when buying anything. 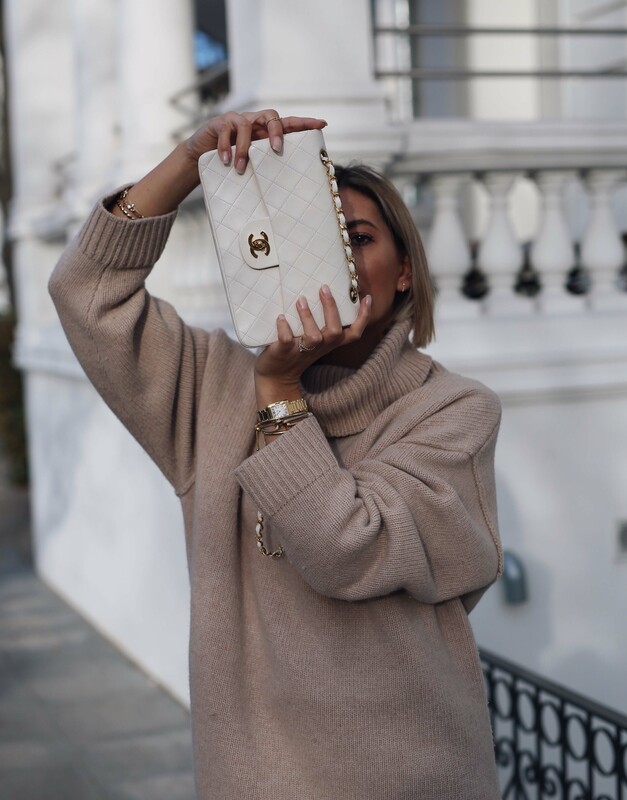 Do you remember my white Chanel bag, which I found on eBay myself? I still get questions all the time today and I’m still so happy with its quality. In addition to that I’m always asked about my Cartier Tank watch, which isn’t being produced in this design anymore since about two years ago, which means that it’s only available from vintage sellers now. You can even find the Rolex Bicolor watches for really good prices on eBay, too. I went searching for my personal favorites and hope that I can give you some inspiration for your next designer vintage purchase with this. Please remember: Sometimes it takes time and meticulous searching until you find your personal highlight. I also go on these long searches all the time and I’m then sometimes unsure whether the offers are legitimate and serious. In the end it may also take a little luck, but eBay definitely offers ideal conditions to make sure you will find the perfect piece. ENG: You guys often ask me about specific pieces that I wear, or whole looks on Instagram, and sometimes there are pieces in the mix that are either from past collections or exclusive brand collaborations. That’s why I oftentimes have to disappoint you, since the products are either not available anymore or completely sold out. When eBay got in touch with me a while ago and asked to work on a project for the fall, I immediately had the idea to create a look with specific it-pieces, which are mostly from past collections. Many of you probably have bought or even sold something on eBay. 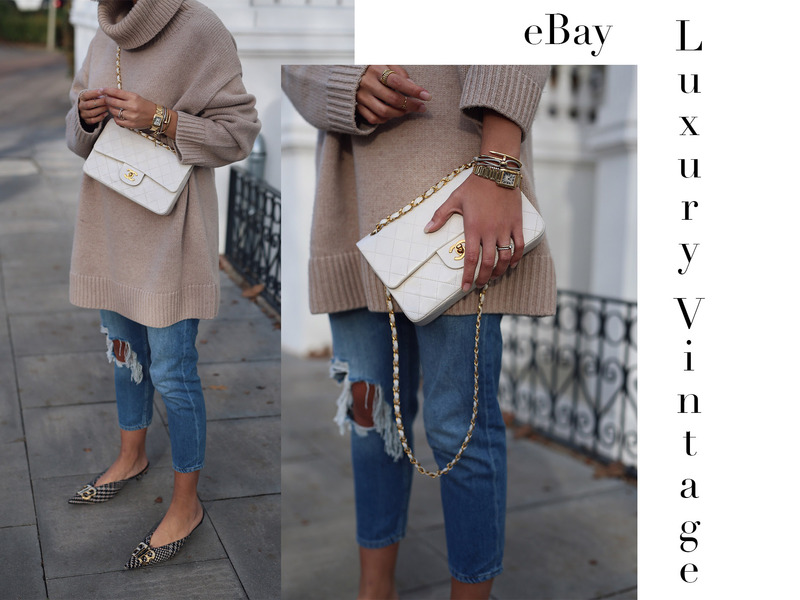 Especially in the fashion market, eBay is very well equipped, and you can find almost anything there, from popular it-pieces to limited editions you can find all the best labels. Did you know that 80% of all items sold on eBay are actually new and 90% can be bought without having to bargain for them? When i got active and searched through eBay, I found something pretty much immediately. Do you remember the H&M coat from last season that was sold out within minutes? You can find said coat on eBay, as well the Levi’s 501 CT, which you guys often ask about, too. Matching this look I went for the Chloé Susanna Boots, which are perfect for the transition of the seasons, and they have been part of almost any online shop for all seasons in the premium segment. I found the boots completely new on eBay, and I was overall able to link my entire look for you, even the Saint Laurent bag. Something that most of probably didnt know: Chloé and Saint Laurent are amongst the most sold brands on eBay. DE: Oftmals werde ich von euch auf meine Kleidungsstücke und Looks bei Instagram angesprochen, dabei ist gelegentlich natürlich auch Mode früherer Kollektionen oder aus exklusiven Markenkooperationen dabei. Dementsprechend muss ich euch dann häufig vertrösten, da die Produkte nicht mehr verfügbar bzw. schon vergriffen sind. Als mich eBay vor einiger Zeit kontaktierte und nach einer herbstlichen Zusammenarbeit fragte, kam mir direkt die Idee einen Look mit bestimmten it-pieces zu kreiieren, die überwiegend aus früheren Kollektionen stammen. Viele von euch haben sicherlich schon mal etwas auf eBay gekauft oder selbst verkauft. Gerade im Modebereich ist eBay sehr breit aufgestellt, von heißbegehrten it-pieces bis hin zu limitierten Editionen könnt ihr auf eBay erstklassige Labels finden. Wusstet ihr, dass 80% der bei eBay verkauften Waren neu sind und knapp 90% der Artikel zum ‚Sofort-Kaufen‘ (kein Bieten erforderlich) angeboten werden? Als ich selbst aktiv geworden bin und eBay durchforstet habe, bin ich schnell fündig geworden. Könnt ihr euch noch an diesen H&M Mantel aus dem letzten Jahr erinnern, der binnen weniger Minuten ausverkauft war? Bei eBay habe ich den Mantel wiederfinden können, genauso wie die Levi´s 501 CT, die zumeist auch auf großes Interesse bei euch stößt. Passend dazu habe ich mich für die Chloé Susanna Boots entschieden, die gerade in der Übergangszeit perfekt geeignet sind und bislang jede Saison fester Bestandteil diverser Online-Shops aus dem Premium-Segment waren. Auf eBay habe ich die Boots im neuen Zustand kostengünstig finden können, allgemein konnte ich meinen kompletten Look bei eBay für euch verlinken, sogar bei der Saint Laurent Tasche bin ich fündig geworden. Vermutlich wissen es viele von euch gar nicht: Chloé und Saint Laurent gehören auf eBay zu den meistverkauften Marken.